It’s difficult and expensive for regulators to catch corporate fraud, but new insights from psychological science may eventually provide new techniques for spotting deception. In general, research has shown that people are not very good at spotting lies. People tend to use nonverbal behaviors when they’re trying to spot a lie, but research suggests that vocal cues are much more reliable. 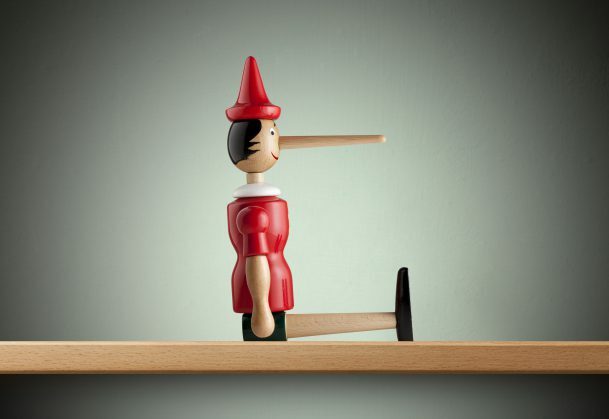 In a comprehensive review of the literature on lying, published in Psychological Science in the Public Interest, Aldert Vrij (University of Portsmouth) and colleagues give an example of this. Participants in one study were supposed to detect lies in a statement from a convicted murder. The more visual cues the participants reported, the worse their ability to distinguish between truths and lies. Those who mentioned nonverbal behaviors, like gaze aversion or fidgeting, as “tells” for lying had the lowest accuracy at spotting lies. Instead, the study showed that listening carefully to what was being said was the best way to accurately discern the truth from a lie. To find out more about verbal “tells” for lying, a team of researchers led by Judee Burgoon of the University of Arizona analyzed the speech of corporate fraudsters. Burgoon and colleagues analyzed over 1,000 statements made by the CEO and CFO of one company during six quarterly earnings conference calls. These two company executives were eventually convicted of fraud in multiple securities class action lawsuits. The corporate earnings conference calls allowed the researchers to accurately compare lying during both scripted, as well as unscripted, speech. These calls are publicly broadcast, and follow a typical pattern; executives give an hour-long presentation on the company’s earnings, followed by an unscripted Q&A with financial analysts. The research team hypothesized that lying would be more cognitive taxing than telling the truth. Compared to making a truthful statement, it might be easier to use simpler language during a lie. Previous experiments indicate that liars enlist specific strategies to try to distance themselves from their lies. They try to keep statements short and use vague or hedging language (e.g., “I guess” and “maybe” or “could,” “might”). Liars also tend to avoid first-person singular pronouns (e.g., “I,” “me,” “myself”), which are usually a clear signal that the speaker is taking ownership of a statement. Using special software, the researchers analyzed sound recordings from these calls at a granular level. In order to differentiate between lies and true statements in the recordings, a financial expert was recruited to code the overstatements and lies related to financial fraud. The analysis confirmed that there were certain speech patterns the executives fell into while lying. Fraud-related speech tended to be more “fuzzy” than non-fraudulent statements; the executives used more hedge words, more distancing language, and more uncertain statements. Contrary to their expectations, the researchers also found that fraudulent statements tended to be longer and more detailed than honest ones. The researchers caution that the results of this study are limited because this study was based on only two people from one company. However, as different types of data become increasingly available – including call transcripts, online chat logs, social media – researchers will have a bigger pool of materials to draw from. “For better or worse, new frauds are exposed on a regular basis leading to an expansion of available data. As additional candidate scenarios and features become available, richer analysis is possible,” the researchers conclude. I’ve seen this to be true — if you listen to what university administrators actually say, this does indicate their lies. As to the issue of intellectual processing, my guess is that it is front-loaded — that the lie is fabricated ahead of time. In other words, if you talk like Donald Trump you are probably lying as he does all those things. Even with out the research, one cannot miss that Trump often follows lies with exaggerated tales that are clearly invented as if to distract listeners from the initial lie, just as these analyses show.